Do you really want to trust your personal data to the cloud where it can be spied upon, deleted, hacked or stolen? Keep your data safe and secure with your own private NAS. "There is NO CLOUD. It's just SOMEONE ELSE'S COMPUTER"
Storing your data on "The Cloud" these days may be a popular option. A NAS which is Network Attached Storage does virtually the same thing for no monthly fees. Unlike having your data stored on someone else's server, knowing your data is safely backed up without a 3rd party snooping through your files, deleting your data or going out of business, is peace of mind only a NAS will provide. Owning your own NAS offers much more control and flexibility over the software that is installed. Besides being used for backing up your data, NAS boxes offer many additional uses. 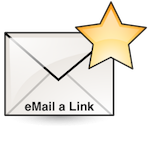 Some of the more popular ones are as a Network Web Server, Email Server, Video Surveillance station, File Server, Music/Video Media Server, or automated Download Station. Your NAS will be available 24/7 for anything attached to your home or remote network. You can even share selected encrypted content with anyone anywhere around the world. A NAS is just like your own personal private cloud without the data cap limitations. Even though the NAS box market is pretty crowded these days with many different manufactures competing for your business, Synology and QNAP are two great companies that have been building high-quality NAS Boxes for a long time now. They include a wide array of features in an impressive line of well designed, top quality NAS enclosures that are among the best. Both QNAP and Synology offer models with high-end premium features and hardware. 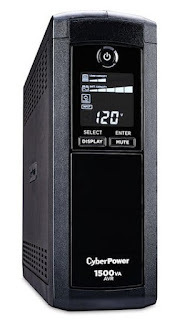 This does come at a higher price then typically cheaper consumer grade NAS units which are typically found in many big box electronic stores. Their business line of NAS enclosures is often found backing up the data of prominent commercial customers. Synology and QNAP are the NAS companies most people turn to when they want the best NAS to store and protect their data. While both Synology and QNAP offer entry level single drive models, a serious NAS will always have a minimum of 2 and up to 8 hard drives or more. This is setup for data mirroring in a RAID array so it will provide redundancy and is the ultimate way to protect your data. 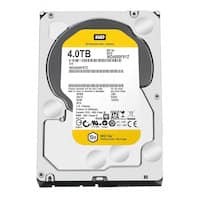 If a hard drive fails, swapping out a drive is easy. A quality NAS box will format the new drive and begin backing up data on it with minimal user intervention. For this comparison, let's look at two upper end diskless enclosures from Synology and QNAP. Looking at the specs it would be easy to assume the QNAP is by far the faster and best choice. This would be true if hardware were the only deciding factor. The software on a NAS also plays an important role in the equation and this is where Synology has always had a distinct advantage. Their DiskStation Manager Software (DSM 6.2) which manages the applications and data that runs on their NAS enclosures is second to none. Synology DSM 6.2 is now out, be sure to update for the latest features. Before you buy a Synology or QNAP NAS, be sure to check out their online demos. Undoubtedly, QNAP makes some very impressive looking hardware along with the specs to blow Synology out of the water in this model comparison. When all things are considered equal looking at hardware specs, QNAP models generally cost a little less. 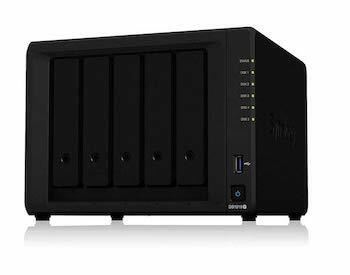 The QNAP TS-453 does come in at a slightly higher price then the closest rival the Synology DS1019+. Synology has always held an advantage over QNAP with their very nice DSM firmware which they update quite often with new features. Buying the best NAS often comes down to personal preferences based on your particular needs and application. Synology released an all new DiskStation Manager (DSM) 6.2 update to its operating system and apps. Their new software has been redesigned to not only further meet the needs of home owners, but also business owners who are using their DiskStations and RackStations as replacement servers. It's highly recommended you try both online NAS software demos to ultimately help you decide which NAS software you could live with, or which you would rather live without. One thing is certain, both Synology and Qnap continue to make some of the best quality NAS boxes available today. For 2019 Synology has released a new lower costs DS218+ 2-bay NAS which features 4K Ultra HD video transcoding. 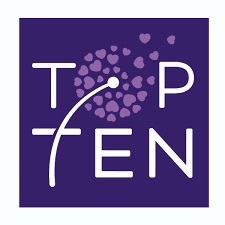 Their latest NAS once again raises the bar and makes it even a much closer race than last year. When it comes to NAS hardware QNAP has once again upped their game. 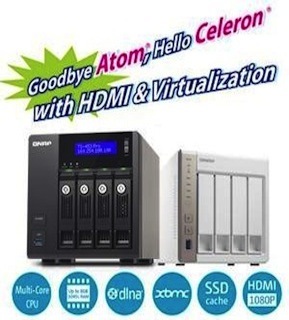 They went away from an Atom processor to a Quad-core Celeron CPU, plus provided an HDMI port. 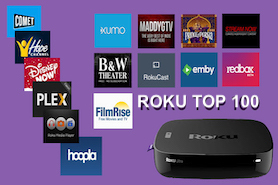 This means it can easily do transcoding duty as an XBMC/Kodi media server. While we still really like the Synology firmware, currently at version DSM 6.1 and a big update is expected soon, without a doubt QNAP makes great hardware and if it was not for Synology's outstanding software they could easily grab the title "Best NAS for 2019"! 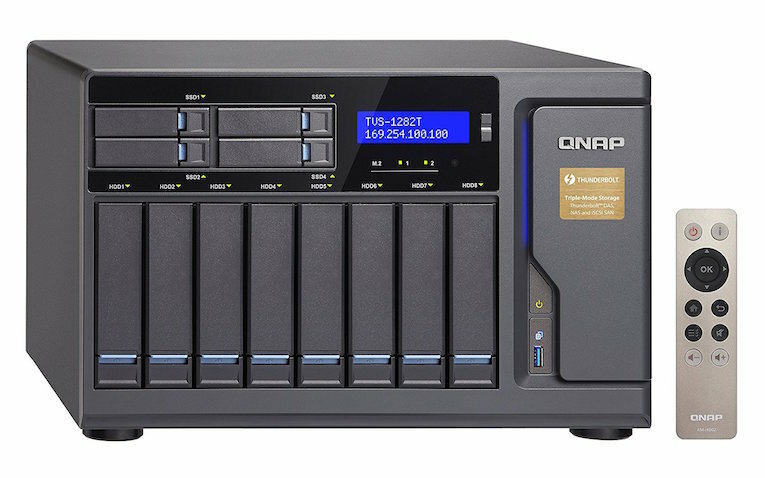 QNAP QTS software does keeps getting better and the QNAP TS-453 Pro is still a top NAS contender. 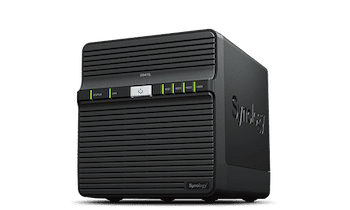 The New Synology DS1019+ is here!